Hey everyone! So sorry I've been MIA for a week. School started back up last Tuesday and I have been so completely exhausted. I'm hoping to start feeling more in the swing of things this week. On Saturday the fiancé and I went to the mall and I convinced him to go into Kohls with me. I's actually kind of funny - every single time he comes shopping with me he ends up buying something. Lauren Conrad has a new collection out and I couldn't leave the store with out this amazing moto jacket in the shade wine tasting. I'm still making sure I have things in my closet to wear it with, but I think it will be a keeper. 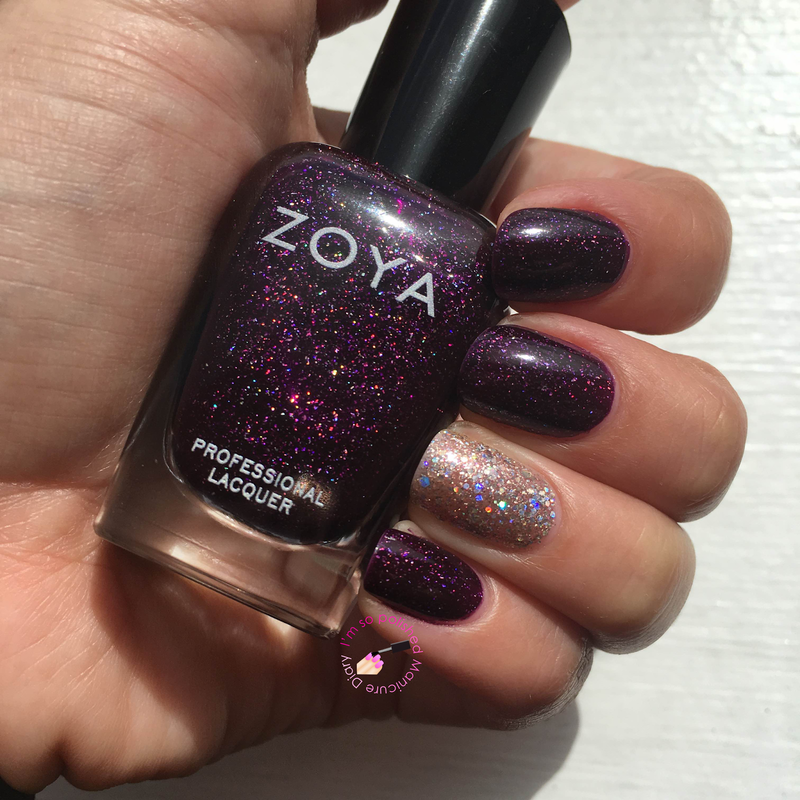 Today on my nails I have the lovely Zoya Payton with an accent nail of Zoya Lux. Payton is a dark purple scattered holographic. It's kind of like a jelly, but I achieved opacity in two coats. This color is gorgeous out in the sun! Lux is a super light pink with holographic hex glitter. I used three coats here. I'm loving everything about this sparkly, blingy mani!